FJ Winch Mount Bumper - Your choice of 3 ComeUp SEAL Gen2 Recovery Winches - Van Beest Shackle Combination for all Toyota FJ Cruisers. 2. ComeUp SEAL Gen2 9500lb Recovery Winch with synthetic rope or steel cable and accessories. There are 3 models to choose from, visit each product listing for more specifications, they can be found under the Related Products tab above. NOTE: You may need to trim the hood release bracket above the winch to have enough clearance for this winch. If you want to add lights look at the Related Products tab and and purchase a couple of the Sirius 2" lights. We offer powder coating in black and silver in a very durable textured powder coat and can do custom colors for an additional fee. Please keep in mind that even though we go to great lengths to protect the coating we are not responsible for shipping damage to any coatings. Expect a 5-7 business day delay in shipping if you want your bumper coated. 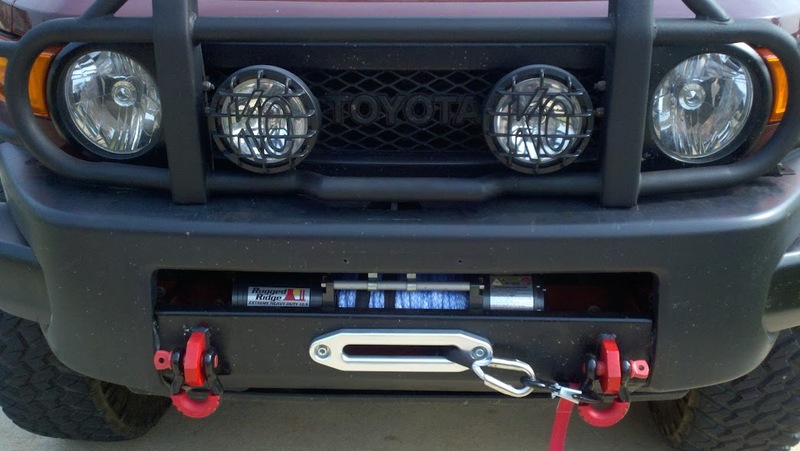 Note: Main photo above is shown with a different brand winch and Sirius lights that are optional. Factor55 thimble not available. Yes, we ship Internationally and have done so to Europe, Japan, Australia, New Zealand, Chile, Russia and the Middle East. It can be expensive as we are shipping a 60lb chunk of steel. Please use our contact form to send us your full shipping information for a quote. Please visit our shipping page for more information. We ship via UPS Ground here in the 48 states. Add the mount to your cart then go to your cart, there you will be given an opportunity to receive a shipping quote based on your address. Please visit our shipping page for more information. Will other winches besides the Viper Max fit this mount? Yes. Just about any winch will work. Read this technical article in our blog for a more in depth answer. The mount uses a standard 10" x 4.5" bolt pattern so any winch will fit and there is plenty of room in the mount itself. The issue is the bracing behind the FJ grille and the A/C line on 2010 and up models. Because of this something with an integrated solenoid/control box (that is located in the center above the spool) might not clear the bracing without removing some of the brace material and/or relocating the A/C line on 2010 and up models (this typically requires an A/C shop). We suggest the Viper Max or a winch of your choice that shares the same basic design with a remote solenoid/control box, this way you can locate the box wherever you want it (see install docs). For comparison, a Viper Max is about 6" tall from the base to the rails above the cable. The solenoid box is about 3" tall and brackets add about another 1". A Viper Max fully assembled with the solenoid box on top would be about 10" tall. Too tall to clear the bracing, at least on 2010+ models. The Viper Max, or a style similar, is the best solution as you can remote mount the solenoid AND the winch comes with enough wire to reach the battery direct. What size winch will fit the mount? As stated above, the mount is drilled for a standard 10 x 4.5" winch bolt pattern. FJ clearance issues are discussed above as well but as far as internal dimensions of the winch 'tub' they are as follows: 33.5" W (left to right) x 8" D (front to rear) x 2 3/4" T (depth of tub vertically). Just about any winch that we know of will fit in the mount. Short answer is maybe. Typically you will see a 3/8" to 1/2" drop by adding the mount (57lbs) and a winch (75-90lbs). This is still a much lighter alternative to a full bumper replacement (75-150lbs without a winch!). In our testing we noticed no difference in how the FJ drove after installation on a stock vehicle. Having said that, because the FJ comes from the factory with some rake (front lower than rear) it wouldn't hurt to lift it a bit to level things out. Read this article about using the Bilstein adjustable shocks to achieve a more level stance and much better ride vs stock. Not really hard at all. It takes more time to prep and paint/coat the mount than it does to install. Figure 2-4 hours depending on your abilities and how big of a hurry you are in. You can read theinstall docs and this forum post during development of the mount for more information including solenoid box mounting options. BLOWOUT PRICING WITH FREE GROUND SHIPPING TO THE LOWER 48 STATES! We have purchased several pallets of these lights and are offering a great deal on a great light for the money! Get em while you can as once they are gone there will be no more of these. We have sold a ton of these lights over the years and they can't be beat for the money. Designed and developed by MotoAlliance electrical experts right here in the USA, these are maximum performance light bars. Polycarbonate lens, aluminum construction, stainless steel hardware and IP68 certification make these durable enough for any trail you take them on. Sirius Standard LED Light Bars combine affordability and reliability to get the job done. Be sure to check out our Sirius PRO line of LED lights too!